Y’all are going to love this recipe. 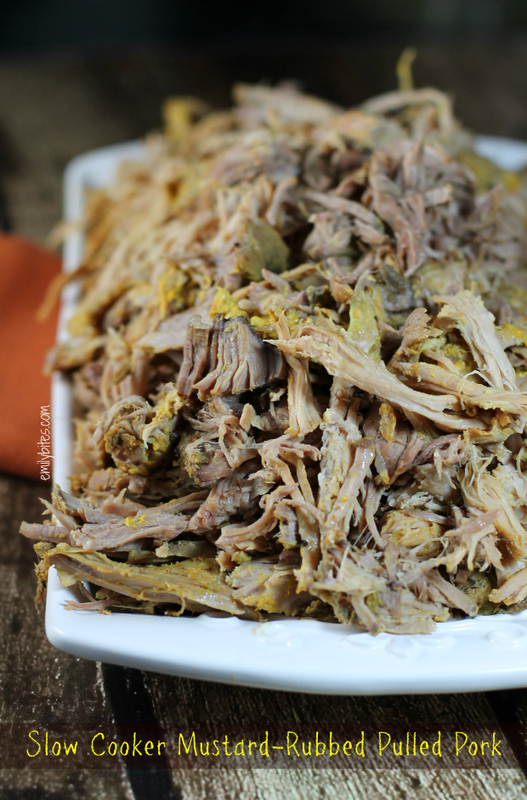 My Slow Cooker Mustard-Rubbed Pulled Pork uses just five ingredients and results in delicious pulled pork that shreds at the touch of a fork and creates a mustardy, slightly sweet, tangy vinegar barbecue sauce that you’re going to fall in love with. 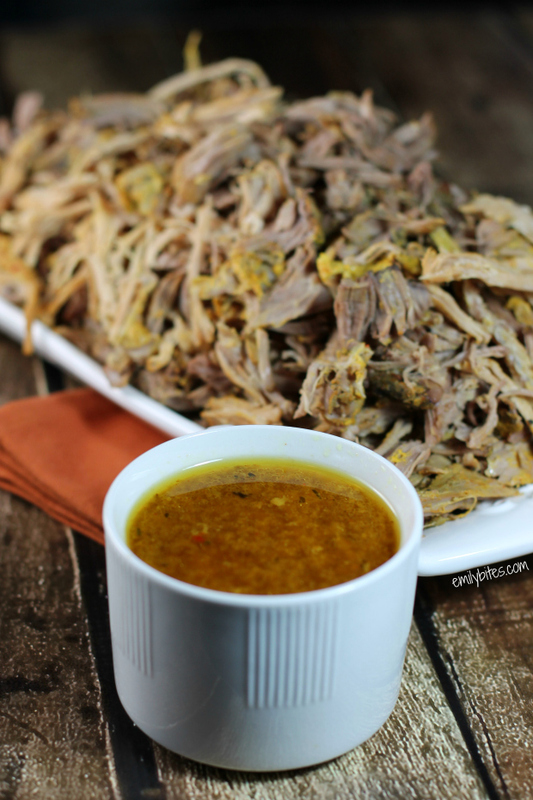 Plus, it’s made in the slow cooker so it’s super easy and perfect for Summer! I get inspiration for my recipes from all different sources. Sometimes it just pops into my head, sometimes it’s the product of thoughtful brainstorming, sometimes it’s inspired by something I ate in a restaurant or adapted from a recipe I saw in a book or on another site, and occasionally it all stems from a brand requesting I use a specific ingredient. When a brand approaches me wanting me to create a recipe using their product, I always consider two things: a) is this a product I already use, love and feel completely comfortable genuinely endorsing to my readers? And b) when first approached do I immediately and excitedly start brainstorming a whole list of ideas for recipes I would love to make using that product? I would never want to work with an ingredient I wasn’t organically inspired by or that I couldn’t recommend enthusiastically. In this case, when French’s Yellow Mustard* wanted to work with me, the answer to both of the above questions was a resounding yes. I pretty much exclusively use French’s mustard (I love it on hot dogs, hamburgers, and turkey melts) and since it’s zero calories per serving it’s a super easy way to add some zesty flavor while sticking to your healthy eating plan. Plus, it’s all natural with no artificial ingredients, which is definitely an added bonus. Just five ingredients – delicious results! I knew immediately what I wanted to make using mustard, I just had to figure out how to adapt it for indoor cooking. My fiancé makes the most amazing mustard-rubbed pork shoulder in his smoker using yellow mustard and it’s actually my favorite thing he cooks. Since I know most households don’t own a smoker, I wanted to see if I could capture some of the same flavors right in the kitchen. Slow cookers make amazing pulled pork, so I thought that would be a good place to start. Since the pork produces its own liquid in the slow cooker, I also thought adding apple cider vinegar would make for a delicious vinegar/mustard Carolina-style BBQ sauce to drizzle over the meat when serving. The results? SO GOOD. The pork slides right off the bone and shreds at the touch of a fork. It’s flavorful from the mustard and brown sugar rub and the sauce is a perfect blend of flavors. If you like the vinegar taste to be a bit stronger (if you plan to serve the meat on buns you may want to consider this), you can add more vinegar to taste in the saucepan step. Serve the meat any way you like: straight up in a pile (my favorite), on a bun, in a wrap, stuffed into a baked potato or baked onto a pizza. Your options for leftovers are only as limited as your creativity! Looking for more tasty ways to use your slow cooker? Check out my Slow Cooker section for more posts, including Thai Peanut Chicken, Meatballs & Marinara, Barbecue Beef and more! Want more French’s Mustard recipes? Follow French’s on Pinterest or check out their hashtag #NaturallyAmazing for Summer BBQ ideas, cooking tips and infinite ways to turn mustard into a meal your family will love. 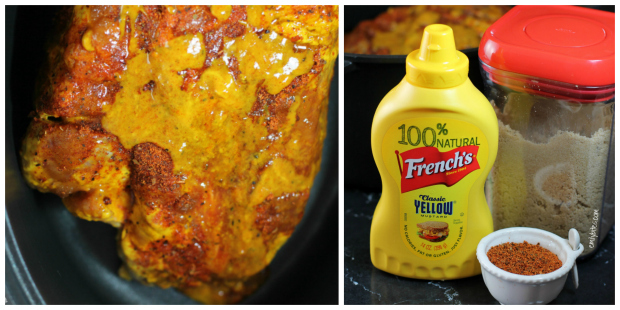 *I have partnered with French’s Yellow Mustard as part of their #NaturallyAmazing Summer campaign. I have been compensated for my time commitment to work with their product, however my opinions are entirely my own and I have not been paid to publish positive comments. On a cutting board, coat the outside of the pork shoulder in mustard (you can probably use a silicone pastry brush, but I just slather it on with my hands…this is a messy step!). Once covered, sprinkle brown sugar over the mustard and pat into the mustard coating. Sprinkle the Cajun seasoning over the top. Place the coated pork shoulder into your slow cooker and make sure any residual mustard/brown sugar coating remaining on the cutting board gets drizzled on top. Cook on low for 8 hours until pork shreds easily and falls off the bone. Remove the bone and discard. Remove the pork to a cutting board and shred using two forks. Taste the cooking liquid and add the cider vinegar (you can add more to taste if desired). Transfer the liquid from the slow cooker to a medium saucepan and bring to a boil. Reduce to a simmer and cook for about 10-15 minutes. Serve the liquid alongside the pork and drizzle over pork before eating – whether eating it straight, on a bun or otherwise. Refrigerate and store sauce separately from any leftover pork. This looks great! A couple of questions: Can you think of any reason why I shouldn’t be able to use the Splenda brown sugar mix I already have on hand? And what’s the basis of Cajun seasoning? I hate to buy another jar of something I’ll rarely use. I have LOTS of spices, and I’m thinking cayenne base with, what, pepper, garlic? I’m eager to try this! Thank you so much! I’ve used the exact cajun recipe Mary posted below before and it’s great. As for Splenda brown sugar substitute, I’ve never tried it or cooked with it so I really can’t say whether it will come out the same. If you try it let me know! I’ve pinned this already! Looks yummy…and I’ve been into Cajun recipes lately, so this just sounds especially good! Thanks! Mary Beth – I made this with the Brown Sugar/Splenda blend the other night and it was delicious! I used the conversion on the package to use the right amount for the substitution. I believe the conversion for the 1/3 cup of regular brown sugar was 2-tablespoons+2-teaspoons, if I remember correctly. I made this yesterday and it’s so good! The only thing I changed was that I used a boneless pork shoulder since that’s all my grocery store had. It fell apart so easily and was amazingly good! I was a little nervous about the Cajun seasoning since I’m not a huge fan of it but when combined with the brown sugar and mustard you couldn’t even pick out the taste. It made my house smell great all day! I’m excited for leftovers at lunch today! Just made this dish this week! So yummy. I also used a boneless roast as someone else posted. Worked just fine. Thanks for the great recipe. Hoping to make this next week. Do you think pork loin would work.? My local Stop and Stop usually doesn’t carry pork shoulder. Not sure why you would remove the fat layer that’s where all the flavor comes from and those of you who use splenda….. OMG!!! don’t you know that splenda is actually a pesticide!!!! I just shook my head when I read all the reviews. Just tried this recipe and it was SO GOOD!! And the leftovers are so versatile! They went great on a Cuban sandwich and also great on a sandwich dipped in the sauce au jus style! Thanks so much for giving me an easy go to staple!